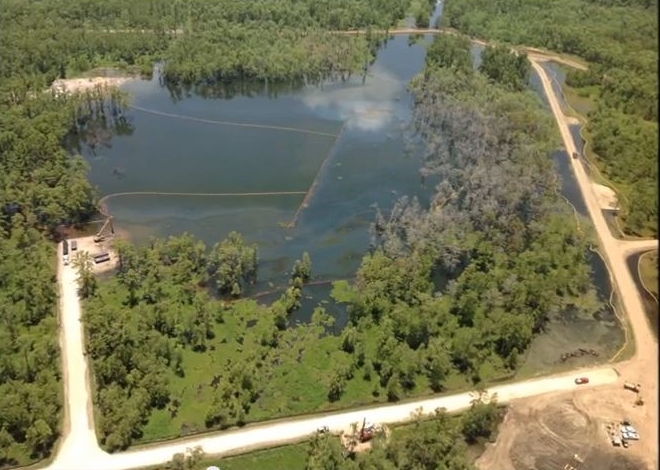 Smoke and Mirrors: Is Louisiana Sinkhole Transforming Area Into a Liquefied Wasteland.? Is Louisiana Sinkhole Transforming Area Into a Liquefied Wasteland.? On July 14, 2013, an Assumption Parish official, John Boudreaux, says the deepest part--picture an upside down witch's hat--of the dangerous gas-emitting 22-acre sinkhole near Bayou Corne is not what Texas Brine previously reported: 110-220 feet, but, at the very least, 500 feet deep. It could even, and most probably is, much deeper. “An Assumption Parish official says the deepest part of the 22-acre sinkhole near Bayou Corne is at least 500 feet deep, and not between 110 to 220 feet deep that has been estimated by Texas Brine. John Boudreaux, director of the Assumption Parish Office of Homeland Security, said previous depth reports released by Texas Brine Co. may have been inaccurate because the company’s sonar did not penetrate debris fields inside the sinkhole. The swampland hole emerged last August after a Texas Brine salt dome cavern failed deep underground. That failure forced the evacuation of 350 residents for almost a year. Texas Brine spokesman Sonny Cranch said Sunday he is confident the company’s depth findings are correct. A Texas Brine contractor has said the sinkhole is from 110 feet to 220 feet deep, according to previous monthly depth-finding surveys. 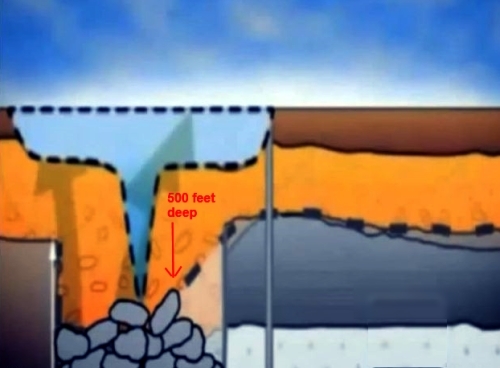 The most recent sonar test on June 7 found the depth of the sinkhole to be 140 feet deep. Boudreaux likened the bottom of the sinkhole to a swimming pool with the deepest part located in the middle. Boudreaux said he did not use a sophisticated method like sonar to measure the sinkhole. Instead, he said, he took a 10-pound crowbar with the ends cut off and attached it to a 500-foot surveyor’s tape measure, drove out to the center of the sinkhole in an amphibious vehicle and let the crowbar go, unspooling the tape measure until it could not go any further. “It’s the simplest of the simple,” Boudreaux said of the device. He performs these checks periodically to confirm the numbers Texas Brine is finding using sonar testing. Boudreaux said he took six other measurements and found the floor in other areas to be between 125 and 180 feet before he found what he described as an “upside-down witches hat,” a deep cone with a pointed end. He said there is debris, including trees, in the sinkhole and the sonar Texas Brine is using is bouncing off the debris, leading officials to find a false bottom. Moreover, a 1600 square foot chunk of land fell into the Louisiana sinkhole abyss (see video below), and due to all of the methane pressures Bayou Corne is expressing, minor explosions abound, not to mention, fish are dying right and left. Off-Shore Pipeline Info: Who Owns What. It lists everything out in the gulf and who owns it.